The mosaic panel in the church-school narthex illustrates The Great Catch of Fish as written in Luke 5:4-11. 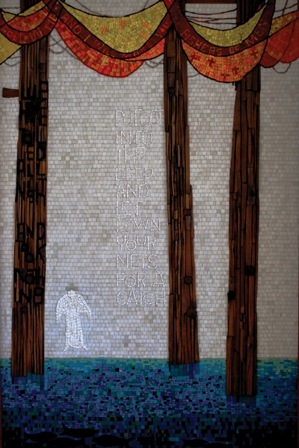 The mural records the words of Jesus as he challenges Simon Peter and the rest of the fishermen to follow him. As you view the panel, note the black poles. They are the piers on which the nets were draped to dry. There are barnacles attached to the piers which represent the many imaginable excuses people use to justify their indifference to Jesus’ invitation. Even Simon’s excuse is written on the wood. He said, “We have toiled all night and took nothing.” Jesus is depicted by the white figure in mosaic, peering into the water. He knows that there are a lot of fish in the sea as illustrated by the fish in the blue waters of the mosaic. Those fish represent all people who are swimming around aimlessly, trying to cope in a broken world. They have never heard about the impact a relationship with God can have on their lives. That same invitation is extended to all generations of people who have had the opportunity to come to know Christ as their personal Lord and Savior. So take the challenge, and go fish.